History of Development of Mathematics. Mensuration, length of arcs, area of sectors of circles, tangents to circles, circumcircle and incircle of polygons, area of polygons, solids-volume and surface area. Fundamentals of mumber theory. Continued fractions. Sets and binary operations, groups, Sylon's Theorems, Rings and ideals, Fields, extension fields, rings of polynomials, finite fields, Galois Theory, constructible numbers. 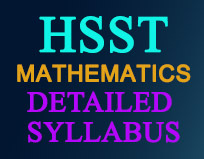 System of Linear Equations -Vector spaces, linear transformations, characteristic values, characteristic polynomial, Minimal polynomial, Cayley-Hamilton theorem, triangulation and diagonalization of matrics. Normed spaces, Banach spaces and related theorems, Linear Maps, inner product spaces, Hilbert spaces and related theorems, finite dimensional and infinite dimensional normed spaces, bounded operators, spectrum, duals and transposes. Adjoints, normal, unitary and self adjoint operators. Polynomial Equations, Trigonometry, Analytical geometry of two dimension and three dimension, similarity of triangles, vectors, matrices. Calculus, applications of differentiation and integration, elemetary functions (logarithms, exponential, hyperbolic, trigonometric etc), Fundamental theorem of calculus, mean value theorems, maxima and minima-functions of more than one independent variables, derivatives, partial derivatives, saddle point, critical point. Real numbers, rational, irrational numbers, algebraic and order properties of Real numbers, supremum property, countable and uncountable sets, completeness property, sequences and series of red numbers, relations and functions, limits and continuity of functions, uniform continuity, differentiability and integrability of functions, Riemann integral, Riemann-Stieltges integral, sequences and series of functions. Term by term differentiation and integration of series of functions. Complex numbers, De Moirre's Theorem, Algebraic properties of complex numbers, regions in the complex plane. Complex functions, analytic functions, harmonic functions, conformal mapping, elemetary functions, derivatives and integrals of complex functions and related theorems, sigularities, residue theorem and its applications, Power series, Taylor series, Laurent series. Metric spaces, topological spaces, basis, subbasis, closed set, closure, interior, boundary, neighbourhood. Connectedness and compactness, locally connected, path connected, locally compact spaces. Functions, continuous functions, homeomorphism, quotient space. Separation axioms and related theorems. First order ordinary differential equations-formation, properties and various methods of solving. Second order ordinary differential equations – formaiton, properties and various methods of solving. Equidimensional equations. Systems of first order equations. Series solutions of first order and second order ordinary differential equation at ordinary and regular singular points. Hypergeometric functions and equations, legendre equations and polynomials. Chebyshev's Equations and polynomials. Bessels equations and Functions. Laplace transform, fourier series, beta and Gamma functions. Formation and solution of first order partial differential equation in two independent variables. Functional dependence, analytic functions. Second order partial differential equation, formation, classification. Wave equation, heat diffusion equation, laplace equation. Numerical solutions of algebraic equations, finite differences, interpolation. Fundamentals of Theory of Wavelets, Fuzzy set theory, Fractal geometry, Modular functions Jordan forms, elliptic functions, Riemann Zets Function, Automate and formal languages, Block Designs. Monodromy theorem, Reimann mapping theorem, product topology and Tychnoff theorem. Solutions at infinity of Differential Equations, Integral Equations, calculus of Variations. Fundamentals of differential geometry, contractions, inverse function theorem, implicit function theorem. Fundamentals of Mechanics and Fundamentals of Fluid Dynamics. Fundamental Rights - Directive Principles of State Policy - Relation between Fundamental Rights and Directive Principles - Fundamental Duties. Programme, Organ and Blood Donation etc. Introduction to English education - various missionary organisations and their functioning-founding of educational institutions, factories, printing press etc. NOTE: - It may be noted that apart from the topics detailed above, questions from other topics prescribed for the educational qualification of the post may also appear in the question paper. There is no undertaking that all the topics above may be covered in the question paper..